Removing Rust from a Gas Tank - Rust911, Inc.
Rust inside of a gas tank can cause damage to the fuel lines if it is left untreated. If you have rust inside your gas tank, it needs to be removed...but how? The first step is to make sure that your gas tank is empty of fuel. After it is empty, wash it out with water to remove any remaining gas/debris/flaked off rust. After the gas tank has been rinsed, it is time to fill it with Rust911. Rust911 Ultra-Concentrated Rust Remover needs to be diluted and then it can be added to the gas tank. If you have a large tank, fill the tank up as much as you can and then rotate the tank every couple of hours to make sure the solution covers the entire tank. Once all the rust has been removed from the gas tank, remove the rust remover and wash the tank with water and allow it to dry. After rust removal, you could also use isopropyl alcohol to help the tank dry faster. Add the alcohol, slosh it around, and dump it out. Make sure the gas tank is completely dry before adding gas back into the tank. The picture below is a gas tank that was extremely rusty. The inside of the gas tank is not shown but it had just as much rust as the outside. Rust911 was used on the tank and it looks brand new! Rust911 saves the day again. 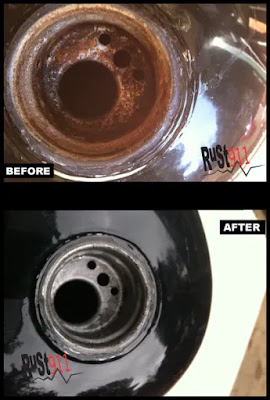 Visit www.rust911.com to order a bottle of rust remover or call 828-446-9809 to speak with a chemical engineer if you have any questions. Rust911 rust removers are as easy as dilute, soak, results.